That poker is fun is well known to all. That poker can get you cash and other rewards is also a fact. But a less appreciated fact about poker is that it also encourages sharing quality time with friends. How’s that you may ask. We will tell you how. Now consider a middle-aged guy, a fan of poker, father 2 kids just sitting at home doing almost nothing over the weekend. Except maybe a few household chores, reading a couple of newspapers, watching some television and other some mundane stuff. He reminisces about the time when he was young and had little or no responsibility. The time when he used to spend in his friends’ company. But all is not lost, my dear friends. Playing poker is unlike watching a movie in a hall, where you have to maintain pin-drop silence. You are engrossed in the game, but no so much that you cannot talk. Actually, it is the best time guys can have to talk and share some interesting, or sometimes not-so-interesting, anecdotes about their lives. An average guy-to-guy meeting is never without booze. There are a few laughs in the beginning, and more often than not, the end of the meeting is filled with some sort of whining and cussing at the world, at the office boss, or just life in general. The good news is: You cannot be having a lot of alcohol while playing poker, unless your idea of playing is dropping unconscious head-first on the table. To focus on the game, you will need to remain in your senses even if you are not playing for big money and are not completely alert. The fact that the game is on also discourages long-drawn conversations over a single topic. That means, the mood is always light with a joke or two passed around periodically. 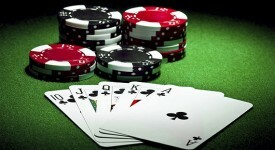 There are only few games that give as much pleasure, excitement, and stimulation as poker does. Add to that the enjoyment of having your close pals around. So just make a few calls, meet at a friend’s place, pick a vacant room, pull a table and start playing the game. Catch up with those old buddies, catch up with those old times, catch up with fun!